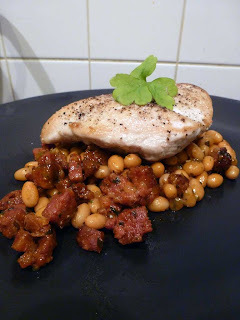 Given the number of times I've mocked the husband for eating baked beans with just about everything (and worse than that he eats COLD baked beans with just about everything), I thought he might have had a dig at me tonight when I sat down to a pile of 'baked beans' with a chicken breast jauntily perched on the top. Thankfully Mike Dilger was on the telly (the wildlife bloke from the One Show) so I managed to get away without comment. But these were no ordinary baked beans. Nor were they Branston Beans which I insist we have instead of those insipid Heinz things. These were James Martin's posh beans. I love this recipe as it is full of simple ingredients, it was really easy to cook - save for the fiddly chopping of shallots - and it was bloody tasty. It's the kind of thing that I can imagine French peasants sitting down to with a huge crusty loaf, slathered in unsalted butter and plenty of wine to wash it all down with. Of course, I'm still trying to be good so this treat came at the expense of having anything on the side. It's something I will make time and again now for a quick lunch (without the chicken). I'm now planning it as the side to whatever crusty loaves I get round to baking when time permits and I've put in enough miles to justify such an indulgence. I do have some leftover beans in the fridge which I'll probably have for lunch with a jacket potato tomorrow. Sadly the 'freshly baked' bread they serve at work is generally stale after it's been sliced and left sitting out for hours on end so that's not an option. Anyhow the blog is supposed to be short this week as I'm back at work which is why I love that this recipe was so quick. I managed to cook two separate dinners and do lunches in about 25 minutes (the husband had ham, egg and chips). The recipe is from James Martin's Masterclass. Place a large frying pan over a high heat and pour in half the olive oil. Season the chicken breasts well with salt and pepper, add to the pan and fry on each side for 2-3 minutes or until golden brown. Place on a baking tray, add the halves of garlic bulb and drizzle with the pan juices, then bake in the oven for 12 minutes or until cooked through. While the chicken is cooking, place the pan back over the heat, add the remaining oil and the chorizo and fry for 2-3 minutes. Add the shallots, rosemary, beans and stock and bring to the boil, then reduce the heat and simmer, uncovered, for 10 minutes. Remove the chicken from the oven and allow to rest, then remove the garlic and squeeze out the flesh from the inside. Chop the flesh well with a knife and add to the beans. Stir in the butter an dparsley and season well with salt and pepper. 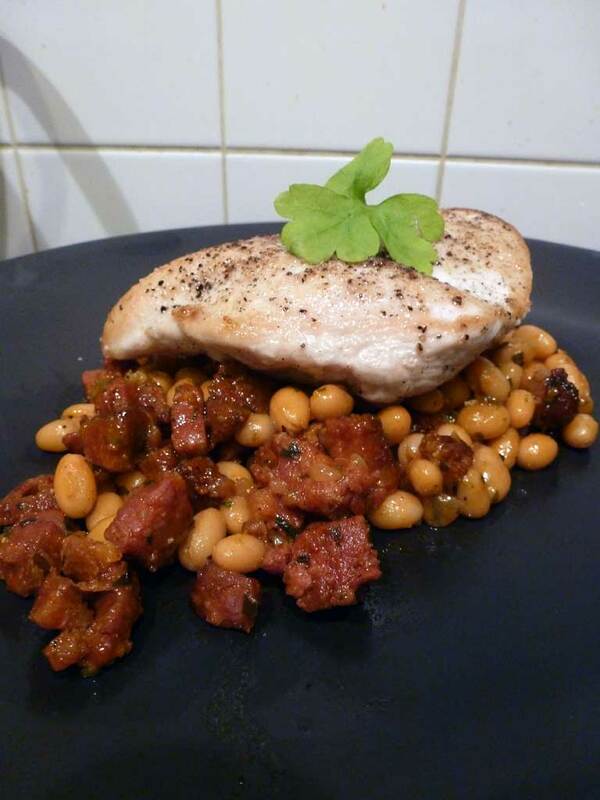 Spoon the beans on to individual plates with the chicken sliced on the top (you can see from the pic I was too lazy for this bit), drizzle with the pan juices and serve.